This album was recorded in the Polydor Studio in Hamburg-Rahlstedt by sound engineer Peter Klemt in December 1961 and in March 1962. This production was first released in the United States the following August under the title THAT HAPPY FEELING and had climbed to Number 14 in the charts by September of that year. The LP was then released on the European market with the title A SWINGIN’ SAFARI in autumn of the same year. 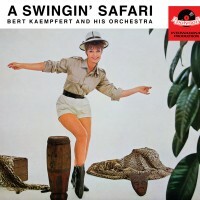 The two Kaempfert compositions A Swingin’ Safari and Afrikaan Beat soon became world hits and have since become evergreens. The success of Take Me famous is down to Dean Martin’s vocal version of the number, and That Happy Feeling, Market Day and Happy Trumpeter were sensational, long-running hits on American radio. At that time, the typical Kaempfert rhythm had been enhanced by a titillating sound coming from the flutes: Bert Kaempfert modeled this music on the sound produced by blowing penny whistles (brass flutes) in the same particular way as in South African Kwela music. The style of this had been influenced by American swing and was very popular among young black people in the townships. In the course of the years, Bert Kaempfert received a number of awards and gold LPs as a reward for the huge success of this album all over the world. But he was particularly delighted to receive a gold LP from South Africa.